The stars may spoil Haider's plans of success, feels Ganesha. Haider - a tragic story retold! Will it hit the bull's eye? Seems like the ace-film director from Bollywood, Vishal Bharadwaj, has a penchant for adapting William Shakespeare's golden classics to intense and haunting silver screen sagas. After Maqbool (based on Macbeth) and Omkara (based on another Shakespearean tragedy – Othello), Bharadwaj, well-known for his broody, dark films and music score in films like Maachis, comes with Haider. His latest film Haider is based on one of the most famous Shakespearean dramas – Hamlet. And, that's not where the intensity ends! This modern day Hamlet – set in the mid-90's – has been told with (the terrorism and troubles ridden) scenic and ethereal Kashmir as its backdrop. Starring Shahid Kapoor and Sharddha Kapoor in lead roles, the movie Haider is also being raved about for Tabu's portrayal of Shahid's step-mother in the movie. Besides, Shahid too, appearing for the first time in a bald look, enraptures the audiences in his mad, passionate, tragic characterisation. Shot at several breathtaking locations of Kashmir, including Sonamarg, Pahalgam and Dal Lake, the film also promises to capture the political intrigue, insurgency, violence and the troubled history of Kashmir. The movie Haider officially releases along with Hrithik Roshan's much awaited Bang Bang. The two movies, besides addressing two entirely different genres, promise different kinds of entertainment for their audiences. 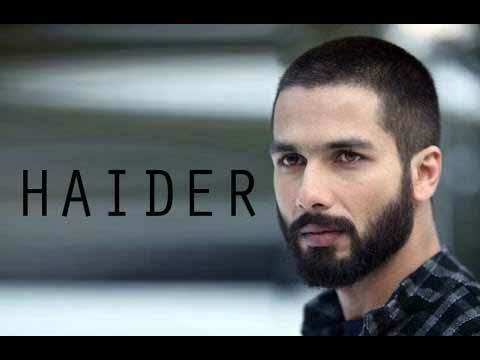 Will Haider please the audiences? Ganesha takes a look at the film's Release Time Chart to predict. The film Haider will be releasing with a Libra Ascendant. The Lord of the Ascendant – Venus - will be in the 12th House - with Sun and Rahu. Mars is Swagruhi in the 2nd House of Finances in this Chart. Moon will be in the Kemdrum Yoga. The Bhagya Bhuvan Lord Mercury will be with Kendradhipati Saturn in the Ascendant, which is exalted. Haider is likely to enjoy a better than average start at the box office. As the Lord of the Ascendant – Venus - is in the Sign of debilitation in the 12th House, it will not be able to create initial attraction at all the territories. Only in some territories, the first day business and the first weekend's business would be good. The film is likely to face tough competition too, because its 7th House Lord Mars is in the 2nd House and it is Swagruhi. The Moon Sign Lord of the release date – i.e. Jupiter's position is still promising. Thus, the overall reaction to the movie won't disappoint the producers, feels Ganesha. However, this movie is not going to get undivided attention. Thus, it will affect its business. The film's direction, scripting and performances will be highly appreciated, feels Ganesha. Thanks to the word of mouth mode, the film is going to get more publicity. As Shahid Kapoor's life path number is 1, which is ruled by the Sun, this movie may be remembered as one of Shahid's best movies. Shahid shall also have a scope of winning awards. The film may also win some awards. Saturn's 10th aspect on the 10th House of success may, however, leave a dampening effect. The major saving grace for the film's commercial success, thus, is Jupiter's position in the 10th House. The Moon, the 10th House Lord is also in the 3rd House. Thus, Ganesha feels that except for the main pockets (like Mumbai - Maharashtra and Gujarat), this film may do only satisfactory or less than average business in the smaller pockets. The overseas business may, however, be better than average. Summarily, Ganesha feels that despite very good credentials, the film Haider is not likely to mint money at the box office. The film's overall business will be average, but film will be worth watching. It may not appeal to the mass audiences, but might appeal to the critics.